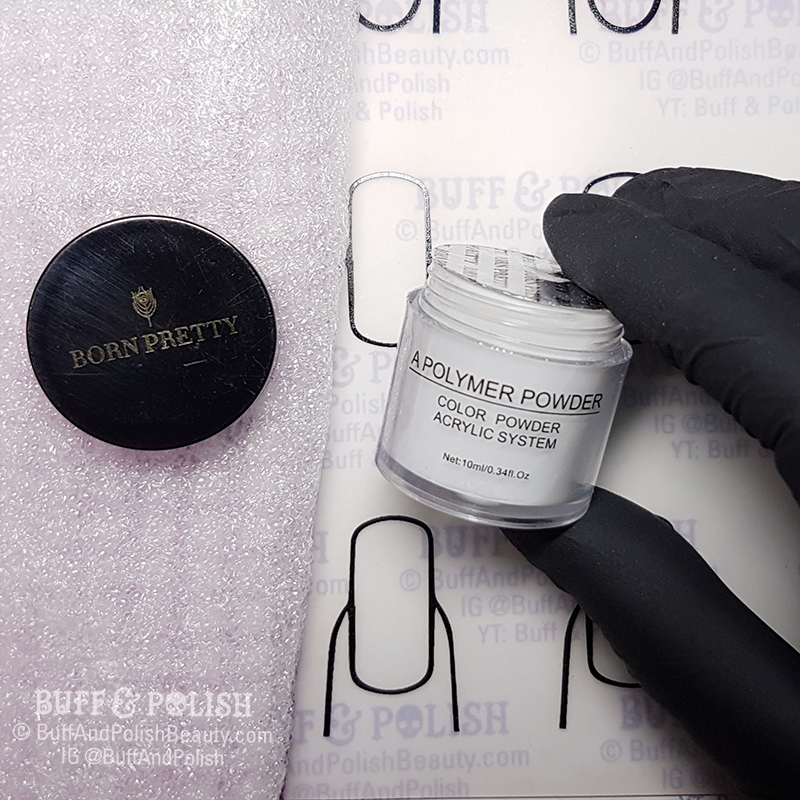 I have a demonstration of the Acrylic Liquid & Powder – Born Pretty Review for these products. There’s a video demonstration to come (if I can). But at a later date. I held off posting this because I haven’t been able to edit up the video demonstration yet due to being stuck in a splint (and on strict rest orders, so most painting & computering has been off-limits), but I’ve decided to post with the images and hopefully add the video whenever it’s ready. 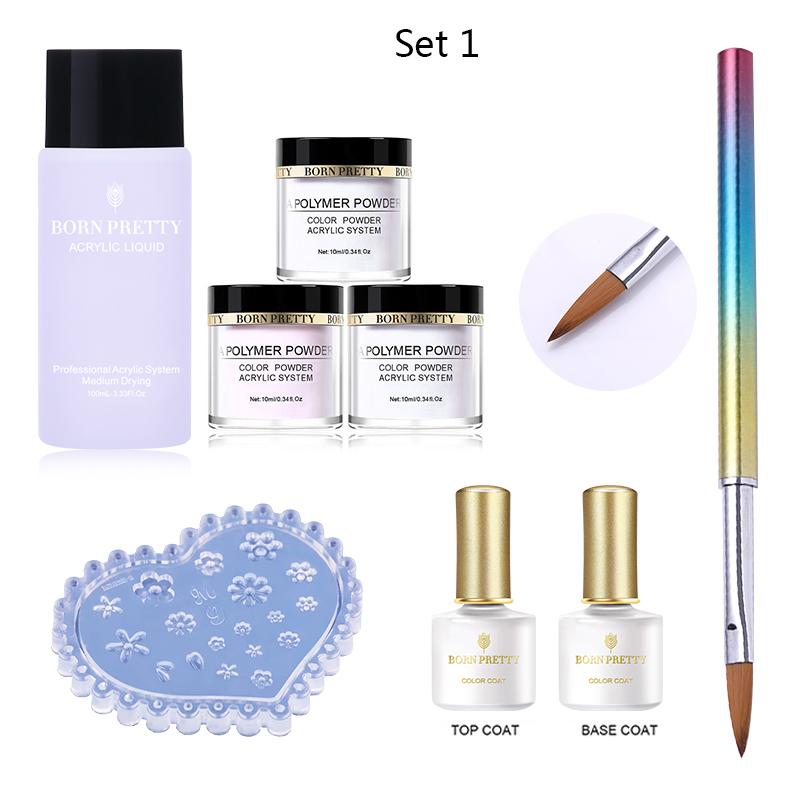 The items I got come from BornPretty.com and are in the listing [Item Number: 43007] individually. I got a white and clear powder and a bottle of the acrylic liquid. There is also a pink powder listed which I didn’t get. 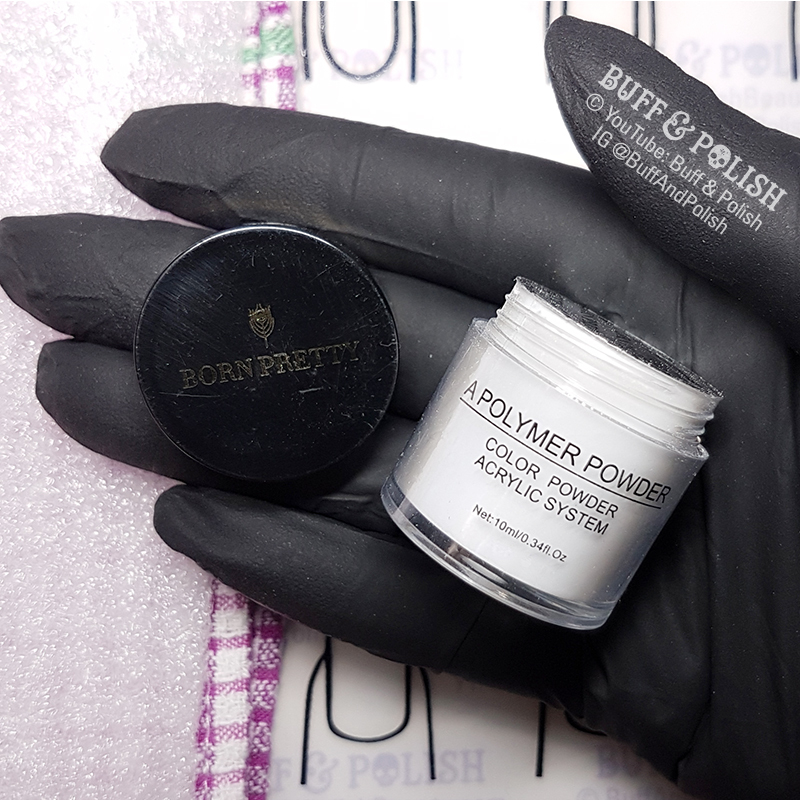 I’m going to start off with an important reminder: If you intend on buying or trying this kit, you should really buy the powder and the monomer and use them together as intended. MONOMERS SHOULD BE USED WITH THE POWDERS THEY ARE DESIGNED FOR. Monomers are not designed to be used with other brand powders. There isn’t really such a thing as ‘Universal Monomer’ from a valid science POV (who cares what the marketing claims). Each brand liquid and powder has differences in speed, accelerators, activator & polymer ratios that works to properly harden (polymerise) the acrylic. The danger with using incorrect or incompatible products can range from brittleness, yellowing, cracking to even causing overexposure and allergic reaction. Which is the main reason I am pointing this out, cos I see people doing it time and again, and since I’m big on safety and education, new users should be cautious. 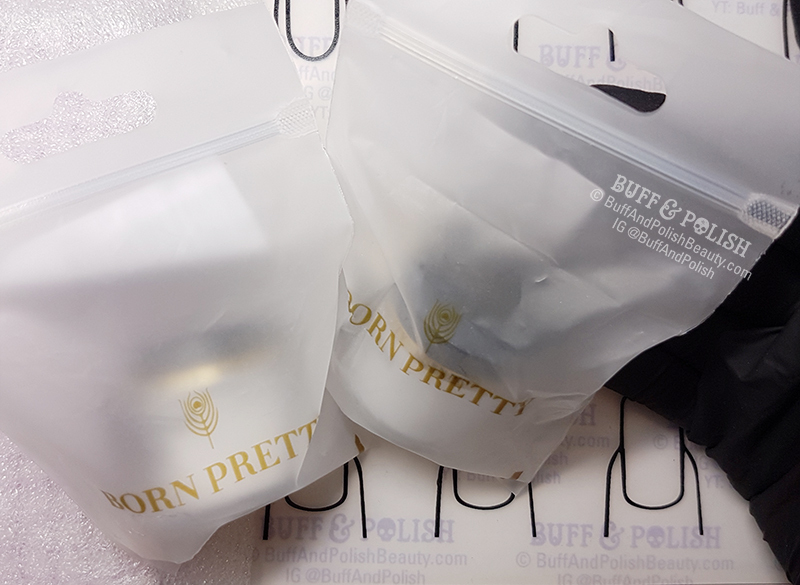 The jars come sealed with a seal and shrink wrap so there is less chance they will break open in shipping. They jars are very cute, about 3cm x 3cm wide & high. They are quite small at 10g each, but very cheap. 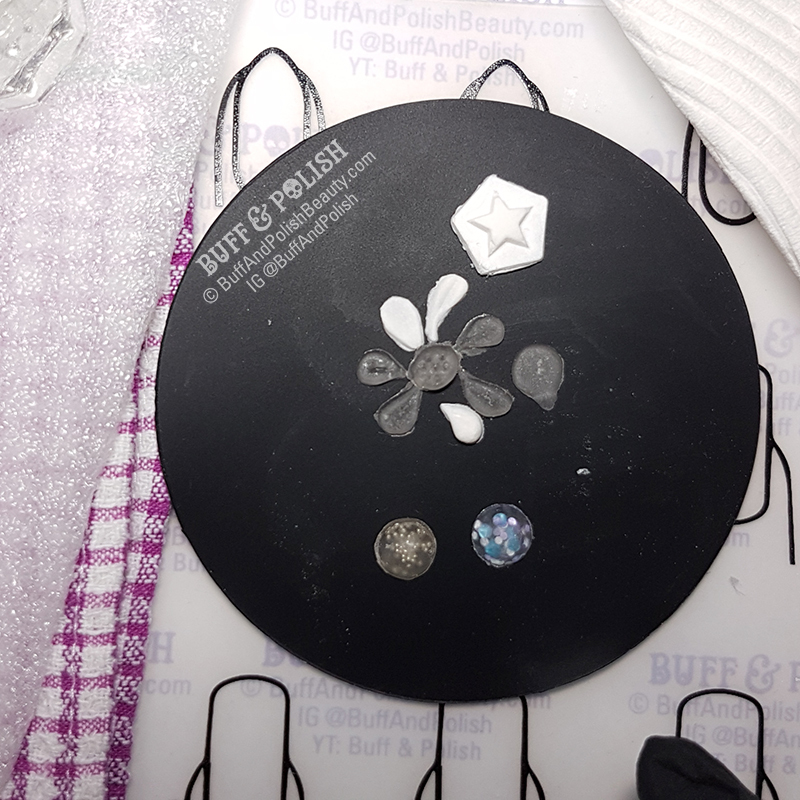 Though you should know how small they are if you intend to use the powders for nail sets, rather than just 3D acrylic decorations because you will go through a jar quite fast using for nails! 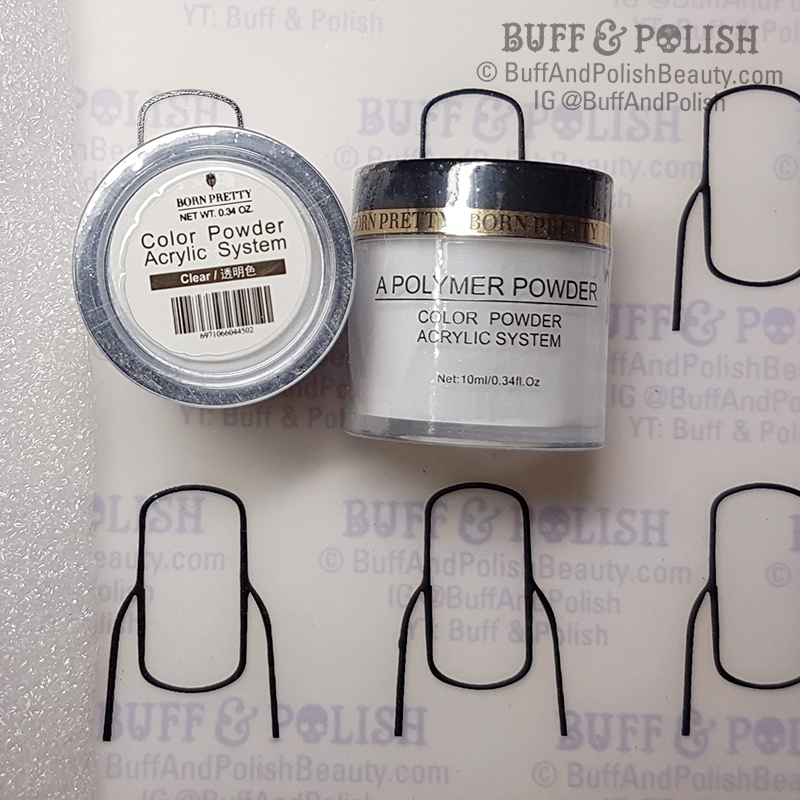 Many regular pots of acrylic powder are on average 1oz (small) to 4oz (regular). 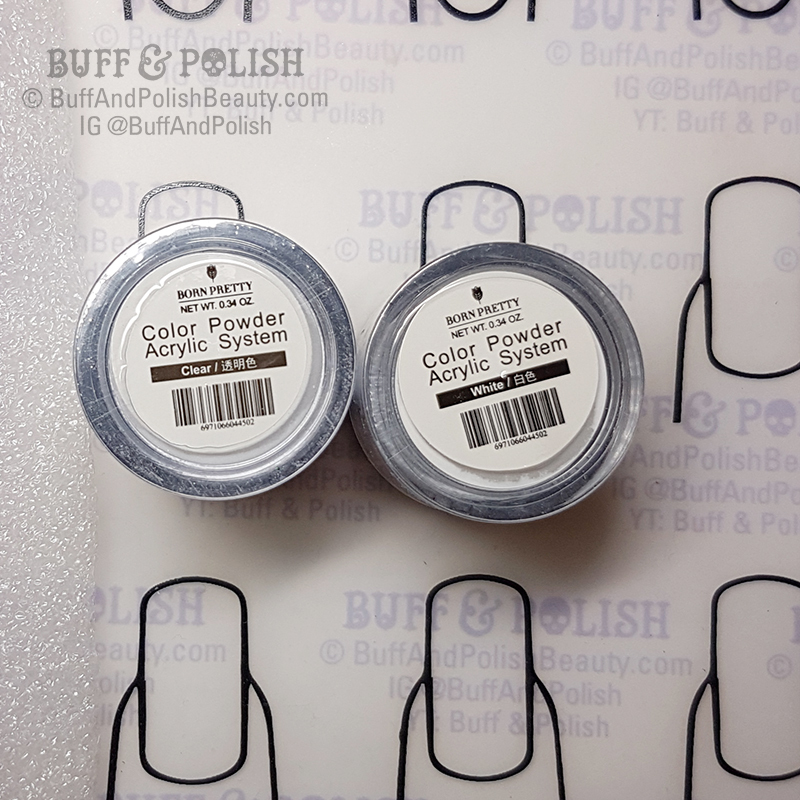 These are less than half of what is in a CND Retention+ small jar for comparison sake, so I would suggest getting 2-3 jars of your chosen full cover colours (clear or pink) to do nail sets with. 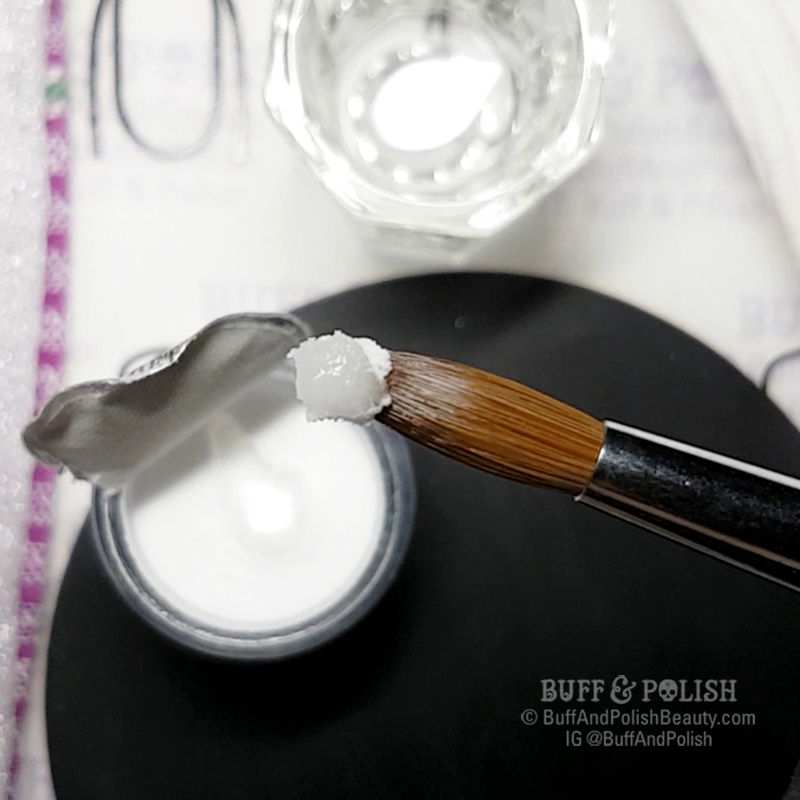 If you use the white for french tips, 1 jar should suffice. 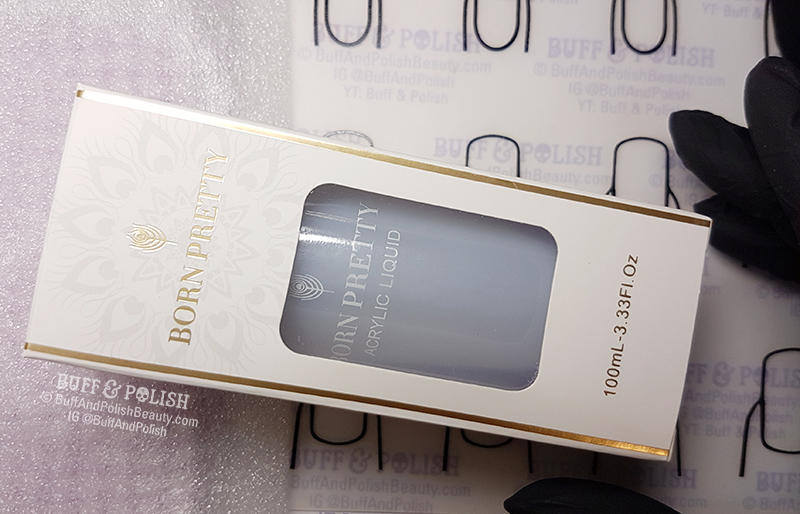 The acrylic liquid comes in a 100ml bottle, so it is an okay size, but again you may want to pick up 2 if you plan to do lots of full nail sets and not just use this in moulds or for petals and 3D shaping. It comes with a top that needs to be pierced to be able to pour to prevent spillage. 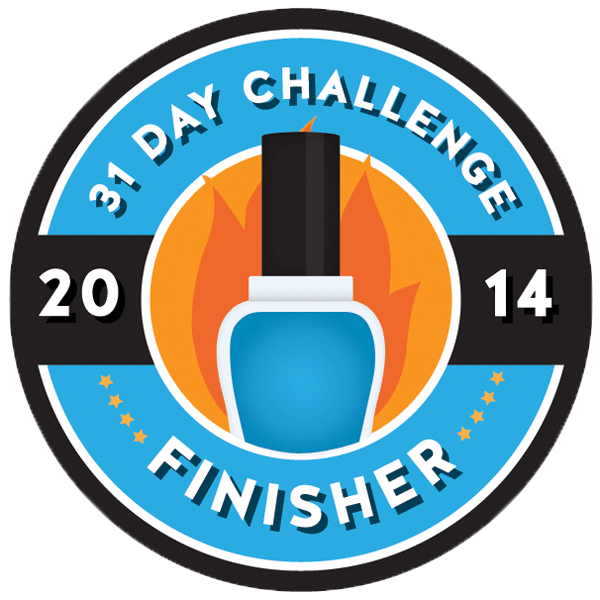 You could use a pin or even a woodstick as I’ve done here. 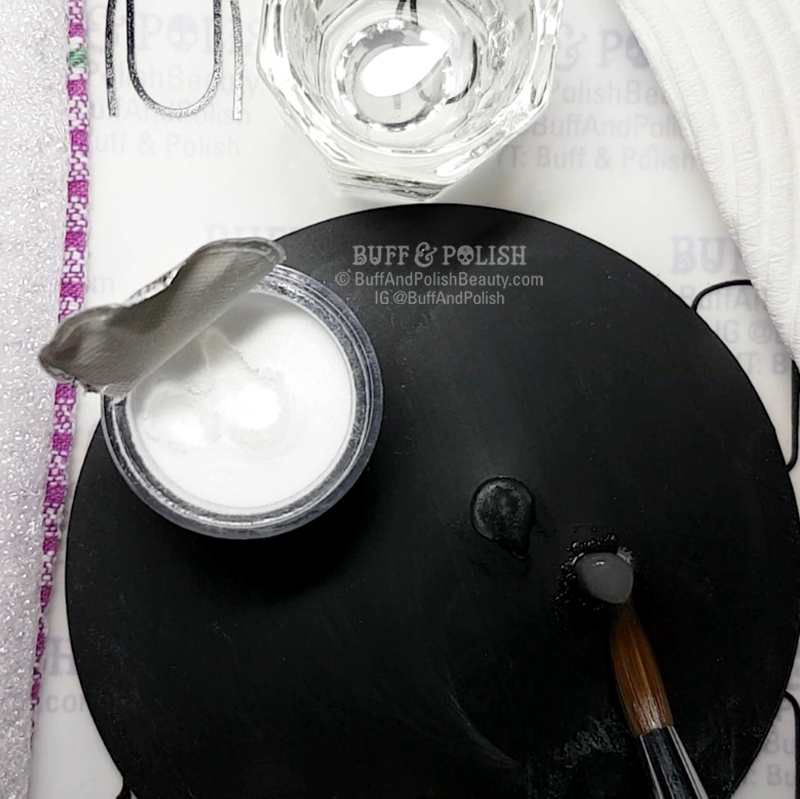 Don’t make it too large and you can pour only what you need into your dappen dish – the lidded glass jar that you put monomer in when working with acrylic systems. Be warned that it is NOT no or low odour, so keep the lid on your dappen dish when not in use, make sure you use it in a really well ventilated room (tip for newbies: I suggest perhaps not your bedroom). Because like with all non-odourless monomers (ie; the regular kind), the strong smell will linger in a badly ventilated space and can take days to dissipate due to the molecules. 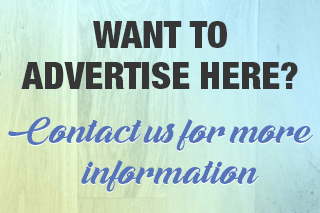 Monomer vapours (the correct term, not fumes as some often wrongly call them) are generally not the kind of thing that you can get rid of with air fresheners. Some of the dried acrylic tests from the video where I demonstrate the items. The drop-shaped things aren’t petals, they were just test droplets that looked that way cos I couldn’t find my oval brush, but I arranged them like a flower cos they reminded me of petals. This really is the better deal if you are new to acrylics and want a cheap set to try out. I’ll try to add the video demo here when if I can get it finished. 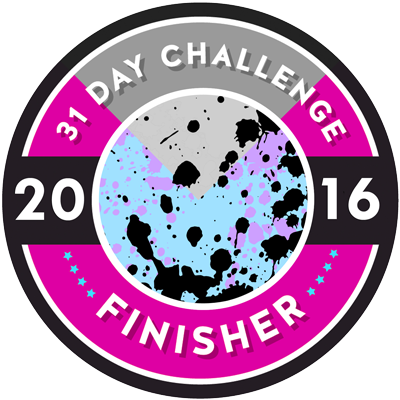 I will have to wait until given the all clear on this after I’m out of the splint – and till after I’m caught up. 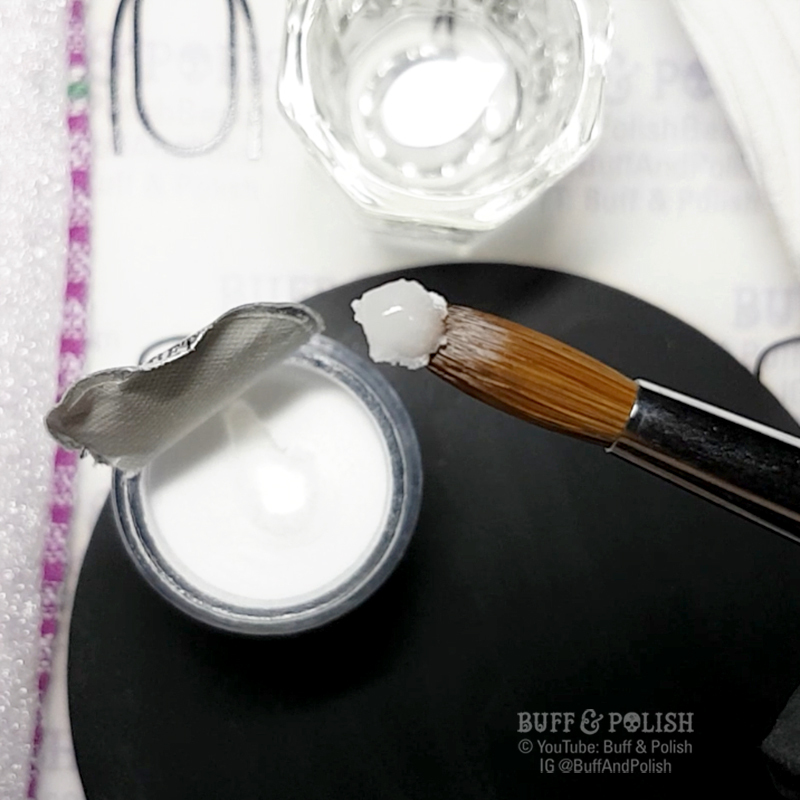 It was easy to use – though getting the correct ratio of liquid to powder may take a little practice if you’re new to acrylics and purchase for making decorations. 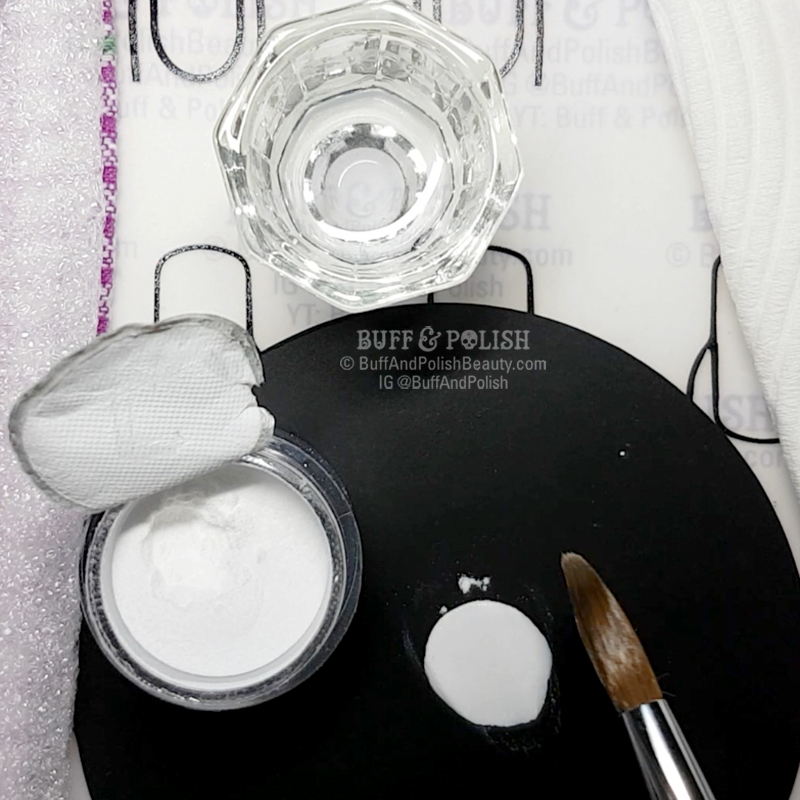 I had no issues with clumping and the powder is milled quite finely. 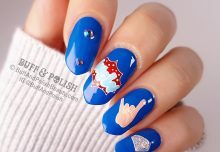 It would also be good for 3D acrylic lace looks or sugar art. It was a medium drying acrylic, faster than some but not too fast so there is a little time to manipulate it into shapes. I used a No. 8 Kolinsky brush and an oval shaping brush. 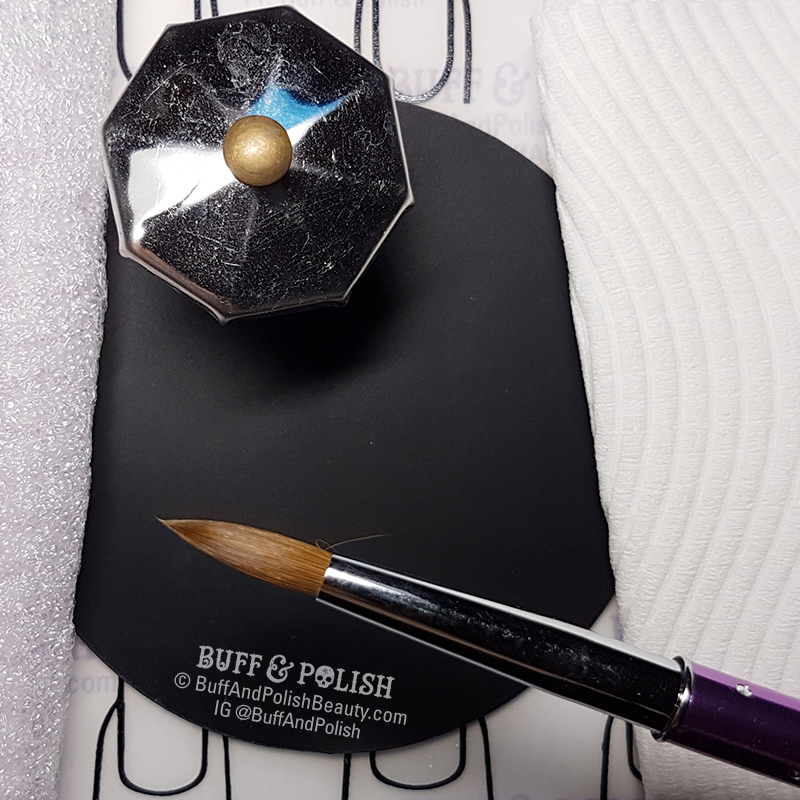 No product was left on the bristles (as should happen with good technique – even though I’m a little rusty) and the only thing that might irk you is the monomer’s lingering smell as it is quite strong. So like I said above, use in a ventilated area. 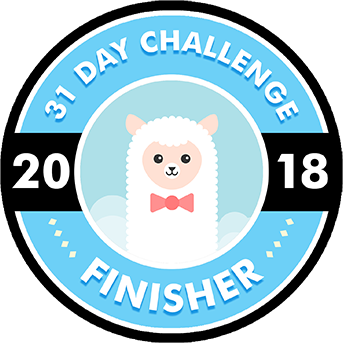 I would recommend this for making charms and decorations. Or for new users looking to try out acrylic systems without spending a mint. 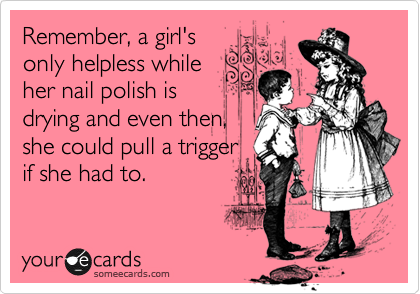 I probably won’t use it for nails myself as I opt for gels and dip extensions these days. 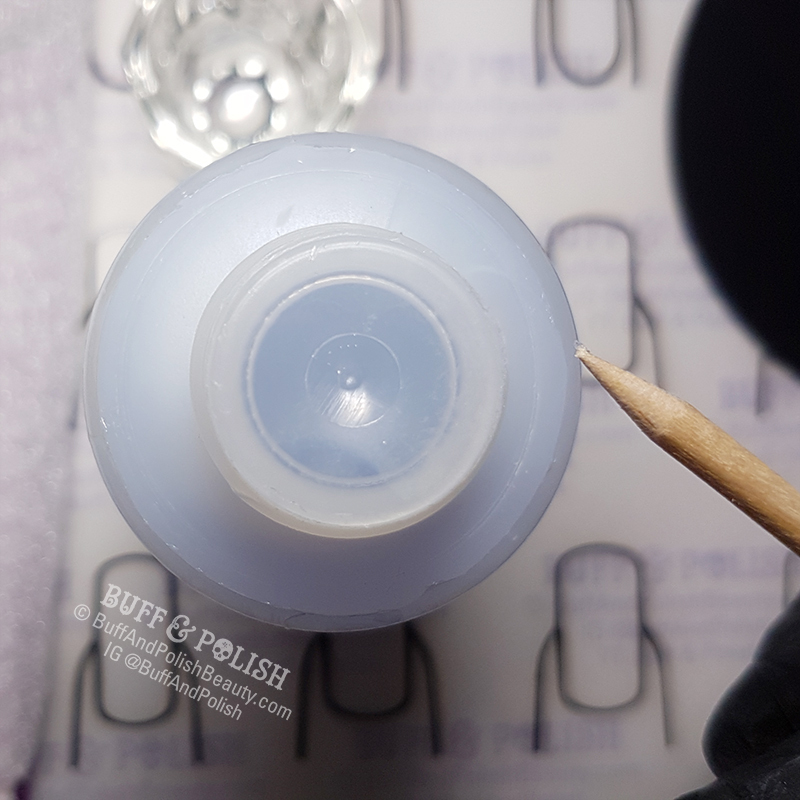 The clear powder’s clarity is quite decent once you top coat it, it is clear but is not always completely transparent if that is what you are expecting (like clear builder gels can be). It certainly worked well enough to encapsulate glitters (as you can see in the image and video demo to come). It’s an affordable way for newbies to see if they like acrylics without having to invest in large quantities. And would last a while used for making nail decorations and petals. 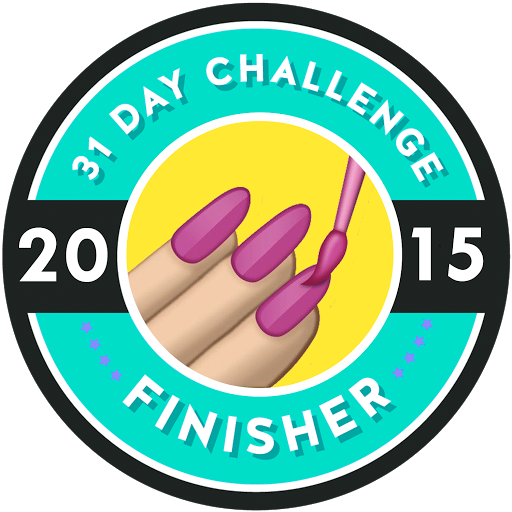 You might still wish to try it if you are used to acrylics as an affordable alternative.